The weekend is here. Yay! And so I'll be signing off here shortly to spend some quality time with my family. But before I go, I wanted to be sure to share a few of the inspiring ideas I came across this week. A huge and happy welcome to our newest guide members! Kathco Jewellery and Basic Invite! Be sure to check out their portfolios! 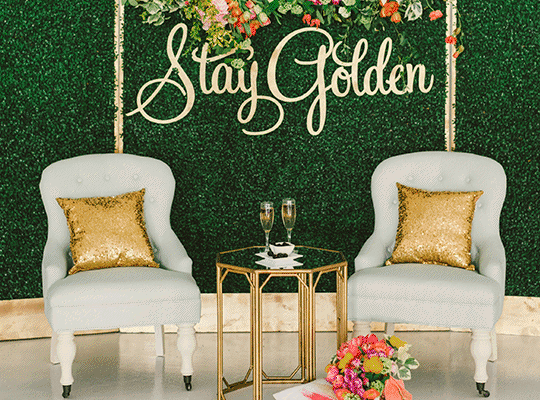 Styled by Grit + Gold, photographed by Stephanie Rose, floral by Stems of Dallas, and signage by Southern Fried Paper. All the items in the photo are Propmaker Event Rentals. A Spring Inspired Yellow Color Palette, yes please! So in love with this Modern Boho Wedding over on 100 Layer Cake! Obsessed with this Seating Area Design featuring Propmaker Event Rentals! Really loving this How-to Floral Arrangement post over on SMP. Lovin those gold pillows. Happy weekend!